Three days ago, on Krypton, Kara is worrying about passing the "final trials", which will allow her to wear the family crest. She looks after baby Kal-El, worried he'll grow up too fast. In the present, Kal and Kara figure out who each other are, Kara doesn't believe him and hits him. Many times. The people who attacked Kara say they retrieved their primary target from the crater, presumably her ship. 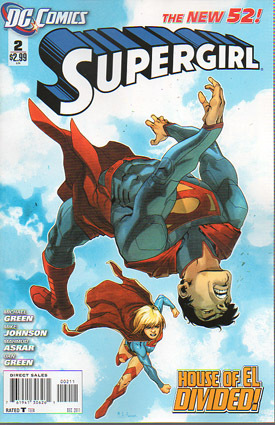 Kara is overwhelmed by her powers again, and Kal flings her into the sky where she discovers she can fly. They fight some more and Kara goes in search of her ship. A shot from the air reveals them over the Great Wall in China. They fight some more, and Kara finally sees people and realizes she is putting them in danger. This gets her to listen to Kal, who tries to explain the source of their powers and the fate of Krypton. In a government facility somewhere, Kara's ship sits on a platform and a red crystal has been removed from it. Story - 4: Quite an improvement over last issue, but there were still two problems that I had. Everything Kara learns in this book, the audience already knows (or at least the vast majority of them do). I know the character had to learn the info, but telling the readers that Krypton is destroyed, their powers come from the sun, etc... it was just information we already had. I think it would have worked better to just cut to those conversations after Kal had already told her, to focus more on Kara's reactions to that information, which are far more important. Still though, things moved along and there was some actual story this time, but still a lot of action. So much action. So, so much. Look, I like action. It's fun, it's exciting, it's entertaining. The fifth time Kara screams a version of "leave me alone/get off me/I don't need your help" and punches Superman again I wanted to fling the book down. It's just too much. Reduce the number of attacks by two and use those pages for more story or character, and you'd STILL have an action-packed book that had a bit more substance to it. Not a bad issue by any means, but two issues in a row we've had virtually non-stop action action action. Cut two of those "actions", I say! Give me a little less gravy and a little more steak! Art - 4: Really good stuff, honestly. Even if I really don't like the new costume designs, everything is pulled off exceptionally well here and was thoroughly lovely to look at. Cover Art - 3: So, uhm... if you count the time Kal attacked Kara, and you count this cover image, the number of attacks in this issue goes from 5 to 7. I think the last thing we needed was yet another punching image, even though this cover is well executed. Or, you know, this cover would have been perfect had there been just one or two attacks within, and not six. When it's that overloaded with nearly identical attacks, one more on the cover just adds to the repetition. Variety! It's the spice of your steak.